Congratulations on your new purchased home in Cape Coral, Florida. Here comes the hard work! Lots of planing goes into performing a flawless and easy move. What exactly are you going to do with all of that extra stuff when you move in. Unpacking and going through all of those boxes, trying to figure out which items you'll keep or get rid of. Remodeling and repairs will now be a priority. Tin Tipper can help with all of this by providing you with a residential safe dumpster rental. 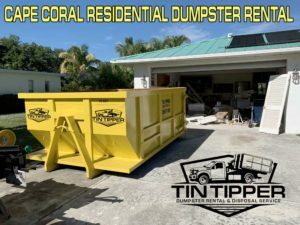 We have compiled five reasons why you should rent a dumpster when you move into that Cape Coral home! When you are prepping to pack for the move to Cape Coral, you can never find enough boxes. Going to your local big box stores can help. Store such as Lowes, Home Depot, Publix, etc. 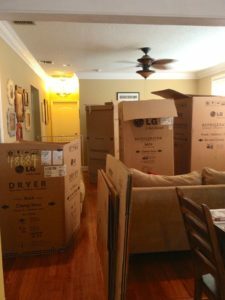 However once you closed on your new residential home these boxes will start to pile up quick. Before you start accumulating all of these boxes into one space, you can throw them directly into our container you rented. Our roll off rental comes with 10 days included in the price. This will give you time to complete your unboxing. A dumpster rental can be just the space you need to rapidly dispose of your cardboard. Want to get even more out of your bin rental, break the boxes down! From the first time you step into that Cape Coral home with your realtor, you were already making a list of DIY remodeling project you should tackle. Maybe the landscape needed a tune up, some cracked paver, rotted heavy lumber, or fencing needing to be removed — How about removing some walls or ripping out all of the carpet and tile from the home. The one thing to remember is that it's much easier to do this while the furniture and contents are out of the home. 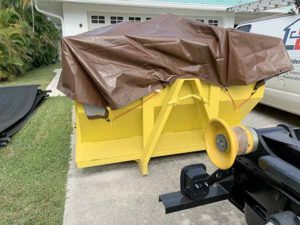 A roll off dumpster rental will handle items from your remodeling projects like roofing shingles, dirt, landscape debris, rocks, concrete blocks, and landscaping lumber / materials. There is very little that you won't be able to load into your dumpster, to see the list of prohibited items click here. Know that Tin Tipper is always here to answer any questions you may have. Amazing customer service oriented realtors have been know offer a free to you dumpster rental when you close on the home. Ask your Cape Coral realtor to put this into the deal, this can be specifically helpful if the home is going to need some remodeling and renovations. We have rented many dumpsters to Realtors helping their clients get the home ready for sale and showings. Rent a dumpster to keep you from dragging all of your debris and trash to the curb. In addition to this City of Cape Coral will actually restrict a lot of what you can dispose of and leave at the street. Waste management will also limit what they will take in one trip. The closest dumps to the city of cape coral are Buckingham dumping incinerator and the Zemel Rd landfill in Charlotte County. When you consider the cost of fuel, time, and dump fees... A bin rental makes a lot of sense. Tin Tipper removing a full container and dropping off a new dumpster in Cape Coral, FL. Moving is a lot of work, let Tin Tipper assist you in reducing your stress? Start enjoying your home sooner, rent a dumpster and simplify your life!!! Be sure to look at our sizes and pricing options! 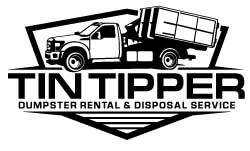 Learn more about Tin Tipper Dumpster Rental today! Drop us a line today to reserve your rental!